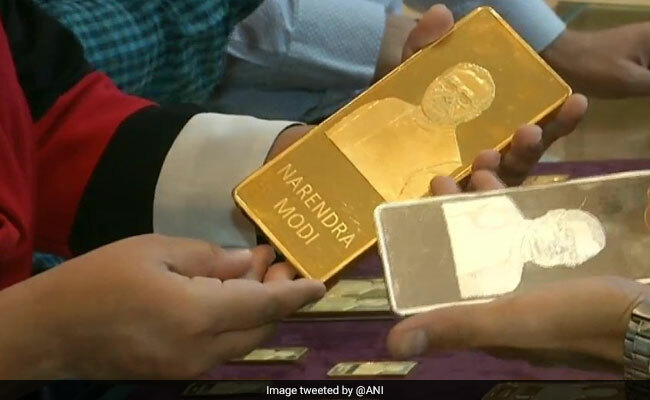 On Dhanteras, gold and silver bars, with a picture of Prime Minister Narendra Modi embossed in it, are being sold at a jewellery shop in Gujarat's Surat. The gold bars have already attracted hundreds of customers claimed the jeweller. "Lord Lakshmi and Ganesh are worshipped on every Diwali and Prime Minister Modi is also like God to us. This year I will buy these bars and worship Modi Ji," a customer told news agency ANI. The jewellery shop owner, Milan said, "Diwali is an auspicious occasion. Since the time Narendra Modi Ji took over as the Prime Minister of the country there has always been development and welfare and hence I thought of making these to mark the occasion." This is not the first time that the shop has manufactured jewellery with Prime Minister Modi's face embossed on it. Dhanteras marks the first day of the big festive week that includes Diwali, Choti Diwali, Bhai Dooj and Govardhan Puja. It falls on the thirteenth day of the Kartik month, according to the Hindu calendar. The festival is also known as "Dhanatrayodashi" or "Dhanvantari Trayodashi".